On alternating Saturday and Sunday mornings, join other members and students looking for extra sailing practice, coached one of our senior instructors. This is a great way to build from Red Flag to Yellow Flag (see Flag Ratings) or earn your Red Flag if your instructor has given you specific skills to work on. 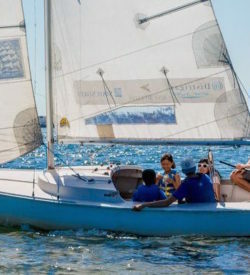 For sailors who haven’t been on the water in a while, group sailing practice can boost their confidence. The class starts with an on-shore chalk talk on topics requested by participants, so come prepared with questions. Students will be paired up to sail together in Rhodes 19s–unless you really want to practice single-handing with some supervision! An instructor in a motorboat will provide on the water feedback and help you work through any challenges in the practice session. The class might focus on particular skills, like docking or crew-overboard recovery techniques, or on drills to improve general boat handling. Let the instructor know which skills you’d like to work on so they can include them in the practice session. Maximum of 12 participants.